Just as the Allies prepared to close on Buna the turning point came in the struggle for the southern Solomons. In the naval battle of Guadalcanal (12-15 November), Admiral Halsey's forces virtually wiped out an eleven-ship enemy convoy, carrying almost all the reserves the Japanese had available for action in the South and Southwest Pacific. After this catastrophic setback, the Japanese gave up trying to reinforce their troops on Guadalcanal, contenting themselves with desperate attempts to keep them supplied so as to prolong resistance as long as possible. 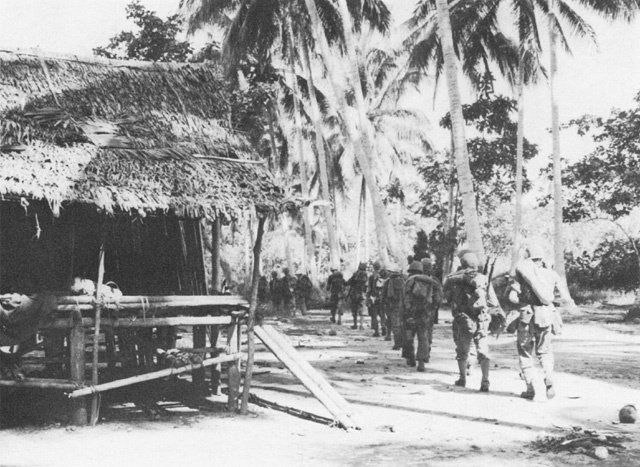 With the island sealed off, Marine Corps troops, reinforced by Army troops (who were arriving on the scene in increasing numbers to replace the marines), could proceed uninterruptedly with the task of destroying the large Japanese garrison left on the island.1 The battle for Guadalcanal had entered an advanced phase just as that for Buna began. 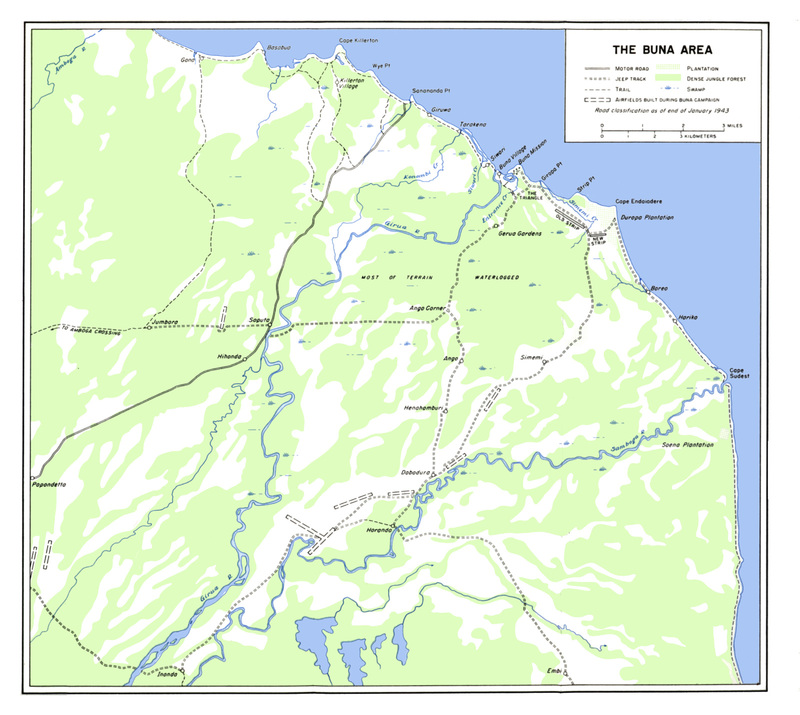 The scene of operations was the Buna-Gona coastal plain, commonly referred to as the Buna area. (Map V) Lying between the sea and the foothills of the Owen Stanley Range, the region is quite flat. In the Buna strips area the elevation is about three feet. At Soputa, some six and one-half miles inland, it is only a few feet higher. The terrain consisted mainly of jungle and swamp. The jungles, mostly inland, were a tangle of trees, vines, and creepers, and dense, almost impenetrable undergrowth. The swamps, filled with a frenzied growth of mangrove, nipa, and sago trees, were often shoulder-deep, and sometimes over a man's head. Scattered through the region were groves of coconut palms, areas of bush and scrub, and patches of kunai grass. The coconut palms, some of them 125 feet high, were to be found principally along the coast at such points as Cape Endaiadere, Buna Mission, Giruwa, Cape Killerton, and Gona, but there were also a few groves inland, surrounded in the main by swamp. Generally the bush and scrub were heavily overgrown, and the undergrowth was almost as impenetrable as that in the jungle. The kunai grass, shoulder-high, and with knife-sharp edges, grew in thick clumps, varying in size from small patches that covered a few square feet to the Dobodura grass plains that extended over an area several miles square. Because of the swamp, there were only three good routes of approach to the Japanese positions east of the river. The first led from Soputa and Ango Corner along the western edge of the swamp to a track junction three quarters of a mile south of Buna Mission which was to become known to the troops as the Triangle. From this junction, one trail led to Buna Village and the other to Buna Mission. A second route of approach was from Dobodura and Simemi along the eastern end of the swamp and along the northern edge of the Old Strip to Buna Mission. A third approach lay along the coastal track from Cape Sudest to Cape Endaiadere, where the trail back-tracked diagonally through Duropa Plantation to the New Strip, and ran thence to Buna Mission. The situation was the same on the western side of the river. There were only two good approaches to the Japanese beachhead positions in that area, and both of them lay through swamp. One was the trail that ran to Gona via Amboga Crossing and Jumbora; the other was the main trail to Sanananda via Popondetta and Soputa. In addition, several branch trails forked from the Soputa-Sanananda track to Cape Killerton, where they joined the coastal trail to Sanananda, Sanananda Point, and Giruwa. In the hot and muggy climate of the Buna-Gona area the humidity averages 85 percent, and the daily temperature, 96° F. The area was literally a pesthole. Malaria, dengue fever, scrub typhus, bacillary and amoebic dysentery were endemic there, as were the lesser ills--jungle rot, dhobie itch, athlete's foot, and ringworm.3 Unless the campaign came to a quick end, disease would inevitably take heavy toll of the troops. Since Admiral Carpender had objections also to sending submarines into the Buna area,7 it became clear that the only help the Allied forces closing in on Buna could expect from the fleet was a few small patrol boats. The air force, in addition to bearing its close support and supply responsibilities, would have to carry almost the entire burden of protecting Allied supply movements northward of Milne Bay, and of beating back enemy attempts to reinforce the beachhead. SIMEMI VILLAGE, along the route of Company M, 128th Infantry, on its way to an advanced position. 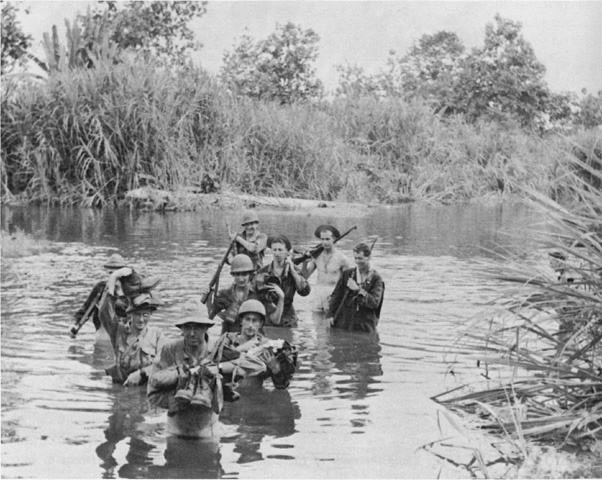 LT. COL. HERBERT A. SMITH leading troops across a river on the way to Embogo. possible for large ships to anchor there and would also make possible the development of Dobodura into a major air base, not only for fighters and transports, but also for all types of bombers. 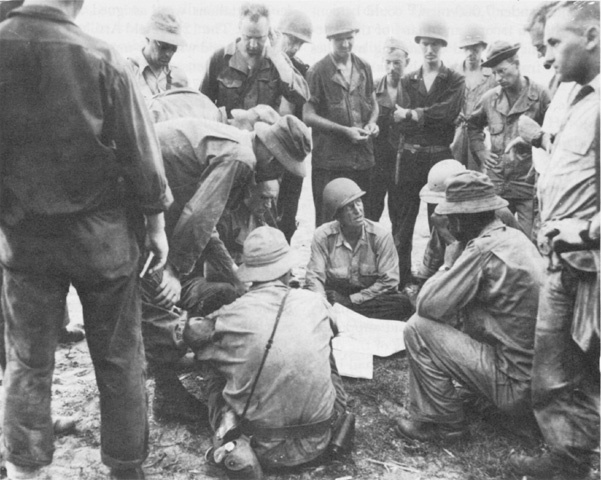 GENERAL MACNIDER (center, facing forward) mapping plans to take Buna. time just under 7,000 men,13 could be considered fresh troops, and many of them because of sickness and exhausting marches were far from their physical peak. Troops in the opening engagements of every war are often found to be ill prepared to wage the kind of war they actually have to fight. This was the case with the 32d Division when its leading elements marched out to meet the enemy in mid-November 1942. Not only were the troops inadequately trained, equipped, and supported for the task in hand, but many of the difficulties they were to meet at Buna had been neither foreseen nor provided for. The 32d Division had expected to fight in the European theater and, in late December 1941, had actually been earmarked for operations there. General Harding joined it in Louisiana in early February 1942. In late February the division was sent to Fort Devens, Massachusetts, and instructed to prepare for immediate movement to Northern Ireland. Ordered at the last moment to the Pacific, the division took on more than 3,000 replacements at San Francisco and reached Adelaide, Australia, on 14 May. Training had scarcely got under way when the division was again ordered to move--this time to Brisbane. The move was completed in mid-August, and training had just got into its stride again at Camp Cable, the division's camp near Brisbane, when the first troops started moving to New Guinea. of its officers, new to the division, had not yet had time to know their men. I have no quarrel with the general thesis that the 32d was by no means adequately trained for combat--particularly jungle combat. A Third Army (Krueger) training inspection team gave it a thoroughgoing inspection about a month before I joined it and found it deficient on many counts. I got a copy of this report from Krueger and it was plenty bad. . . .
On the other hand I found the division well disciplined, well behaved, and well grounded in certain elements of training. . . . My estimate of training when I took over is that it was about on a par with other National Guard divisions at that time. Neither General Harding nor his artillery commander, Brig. Gen. Albert W. Waldron, believed that the infantry could get along very well without the artillery. Strongly supported by Harding, Waldron kept asking that the divisional artillery be brought forward. General MacArthur's headquarters did not have the means either to bring all the artillery forward or to keep it supplied when it got there. Not being at all sure that artillery could be used effectively or even be manhandled in the swampy terrain of the beachhead, GHQ was cool to the proposal. 107TH MEDICAL BATTALION CORPSMEN AT WARD'S DROME near Port Moresby awaiting a flight to Pongani. The 2d Battalion, 126th Infantry, and the troops who had marched with it across the mountains had been severely affected by the ordeal. The 128th Infantry, whose name for Pongani was "Fever Ridge," was not in much better condition. As the commander of the 2d Battalion recalls the matter, the trouble was that the men had been on short rations since mid-October; that they had made some extremely exhausting marches through the jungle "on a diet of one-third of a C-ration and a couple of spoonfuls of rice a day"; and that many of them already had "fever, dysentery, and jungle rot. "32 General Eichelberger put the whole matter in a sentence when he wrote that, even before the 32d Division had its baptism of fire, the troops were covered with jungle ulcers and "riddled with malaria, dengue fever, and tropical dysentery. "33 Sickness and exhaustion had already claimed many victims; they would claim many more as the fighting progressed. A Ground Forces observer, Col. H. F. Handy, noted that, as November opened, many in the 32d Division felt "that Buna could be had by walking in and taking over. "36 Another Ground Forces observer, Col. Harry Knight, noted that "the lid really blew off, when the order was received on 3 November that American troops were not to move forward from Mendaropu and Bofu until further instructed. The reason for the order was, of course, to gain time in which to stockpile supplies for the impending advance, but the division, restive and eager to be "up and at 'em" did not see it that way. These optimistic views on the possibilities of an early Japanese withdrawal did not agree with General Willoughby's estimates of the situation. Willoughby estimated enemy strength on 10 November as two depleted regiments, a battalion of mountain artillery, and "normal" reinforcing and service elements--about 4,000 men in all. He thought that an enemy withdrawal from Buna was improbable, at least until the issue was decided at Guadalcanal. It was known, he said, that General Horii's orders were definitely to hold Buna until operations in the Solomons were successfully completed. These orders, the Japanese hope of success in the Solomons, and what was known of the character and mentality of the Japanese commanders involved made it highly unlikely, General Willoughby thought, that there would be "a withdrawal at this time." This was a sad miscalculation. The Japanese were present in much greater strength than the 32d Division supposed, and superbly prepared defensive positions stood in its way, as well as in the way of the 7th Division which was to attack farther to the west. The Japanese defense was built around three main positions. One was at Gona, another was along the Sanananda track, and the third was in the Buna area from Girua River to Cape Endaiadere. Each was an independent position, but their inward flanks were well guarded, and lateral communications between them, except where the coastal track had flooded, were good. Gona, a sandy trail junction covering the Army anchorage at Basabua, was well fortified, though its proximity to the sea made impossible defense in any depth. There were strong and well-designed defenses along the Sanananda track and at the junction of the several branch trails leading from it to Cape Killerton. On the other side of the Girua River equally formidable defenses covered the Buna Village, Buna Mission, and Buna Strip areas. area ruled out the possibility of deep trenches and dugouts, the region was studded instead with hundreds of coconut log bunkers, most of them mutually supporting and organized in depth. In general, they were of two types: heavily reinforced bunkers located in more or less open terrain, and smaller, less heavily reinforced bunkers built where the terrain was overgrown with trees and vegetation that offered the defenders a measure of protection against air bombardment or artillery fire. There were a few variations. Now and then where the terrain particularly favored them, the Japanese had large, squat, earth-covered blockhouses, each capable of holding twenty or thirty men. In addition, they had a few concrete and steel pillboxes behind the New Strip. Except for these variations, which were on the whole rare, the standard Japanese bunker in the area was of heavy coconut log and followed a common pattern. The base was a shallow trench, perhaps two feet deep. It was six to eight feet long and a few feet wide for the smaller bunkers, and up to thirty feet long and ten feet wide for the larger ones. Heavy coconut logs, about a foot thick, were used for both columns and crossbeams. The logs were cut to give the bunkers an interior height of from four to five feet, depending on the foliage and terrain. The crossbeams forming the ceiling were laid laterally to the trench. They usually overlapped the uprights and were covered by several courses of logs, and often by plates of sheet steel up to a quarter of an inch thick. The walls were revetted with steel rails, I-beams, sheet iron, log pilings, and forty-gallon steel oil drums filled with sand. As soon as the framework was up, the entire structure was covered with earth, rocks, and short chunks of log. Coconuts and strips of grass matting were incorporated into the earth fill to assist in cushioning the pressures set up by high explosive, and the whole structure was planted with fast-growing vegetation. The result could scarcely have been improved upon. The bunkers, which were usually only about seven or eight feet above ground, merged perfectly with their surroundings and afforded excellent concealment. As a further aid to concealment, firing slits were usually so small as to be nearly invisible from the front. In some cases (as when the bunkers were intended merely as protection from artillery and air bombardment) there were no slits at all. Entrance to the bunkers was from the rear, and sometimes there was more than one entrance. The entrances were placed so that they could be covered by fire from adjacent bunkers, and they were usually angled to protect the occupants from hand grenades. 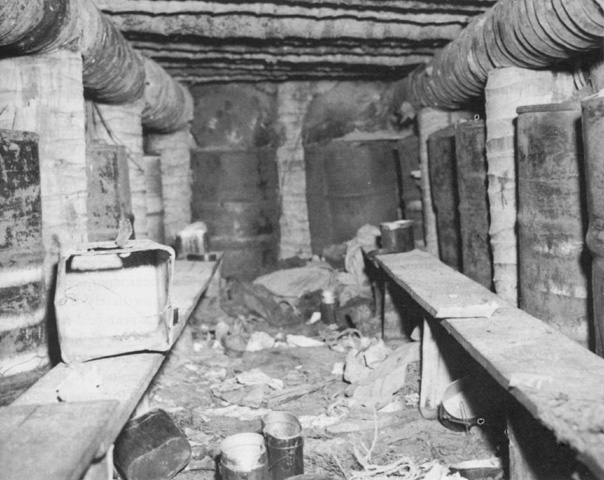 The bunkers either opened directly onto fire trenches or were connected with them by shallow crawl tunnels. This arrangement permitted the Japanese to move quickly from fire trench to bunker and back again without fear of detection by troops only a few yards away. 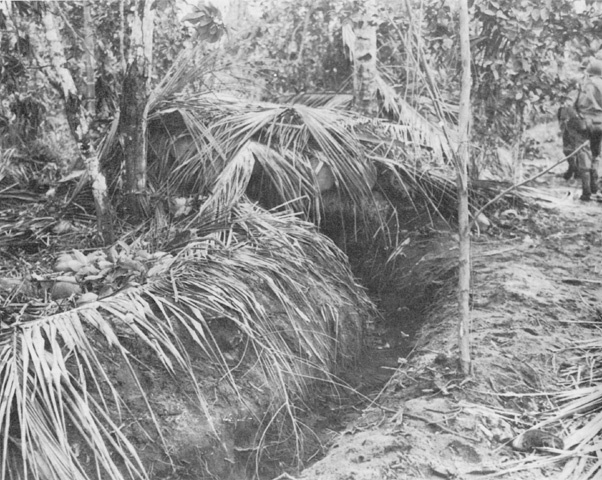 COCONUT LOG BUNKER WITH FIRE TRENCH ENTRANCE in the Buna Village area. INTERI0R OF COCONUT LOG BUNKER reinforced with sand-filled oil drums near Duropa Plantation. a masterpiece. It forced the 32d Division to attack the enemy where he was strongest--in the Triangle, along the trail leading to the bridge between the strips; along the northern edge of the strip; and frontally in the Duropa Plantation. By canalizing the Allied attack into these narrow, well-defended fronts, the Japanese who had short, interior lines of communication, and could shift troops from front to front by truck and landing craft, were in a position to exploit their available strength to the maximum, no matter what its numerical inferiority to that of the Allies. The Japanese were in a bad way. In the long retreat from Ioribaiwa (and especially at Oivi and Gorari) and in the crossing of the Kumusi, they had lost irreplaceable weapons and supplies. Their most critical shortages were in small arms, food, and medical supplies--items that Lt. Col. Yoshinobu Tomita, the detachment supply officer, had for some time been doling out with a careful hand. The troops had been on short rations for a long time, and the ration was progressively decreased. To eke it out, the few horses that were left were being gradually butchered for food. There was a great deal of sickness. Nearly all the troops being admitted to the hospital for wounds and disease were found to be suffering as well from exhaustion and general debility. There had been serious outbreaks of malaria in the ranks, and a large proportion of the men had dysentery of an aggravated kind. Despite these difficulties, the position of the Japanese was by no means hopeless. They had good stocks of ammunition, a strong defensive position, and enough men and weapons to hold it for a long time. What was more, they had every reason to expect that Rabaul would quickly reinforce and resupply them. Their orders were to hold, and, with a little help from Rabaul, they were prepared to do so indefinitely. Colonel Yokoyama himself took over the defense of the vital Sanananda-Giruwa area. He ordered some 1,800 men--headquarters and one company of the 3d Battalion, 41st Infantry, the main body of the 1st Battalion, 144th Infantry, a portion of the 15th Independent Engineers, a 700-man contingent of Formosan naval laborers, and some walking wounded--to front-line positions at the main junction of the Sanananda and Cape Killerton trails. The salient, known to the Japanese as South Giruwa, was divided into northern, central, and southwestern sectors, and put under command of Colonel Tsukamoto. In reserve at the second trail junction a half-mile to the north, Colonel Yokoyama stationed a second company of the 3d Battalion, 41st Infantry, a mountain gun battery, about 300 men of the 15th Independent Engineers, and a portion of the antiaircraft battalion. Colonel Yokoyama moved his headquarters to Sanananda at the head of the trail and there stationed a second mountain artillery battery, the cavalry troop, the rest of the 41st Infantry, and most of the naval construction troops in the Giruwa area. Reinforcements were quickly forthcoming. Tokyo had realized for some time that, despite the emphasis on retaking Guadalcanal, troops would also have to be sent to the Buna-Gona area if the beachhead was to be held. The troops immediately available for the purpose were several hundred 144th Infantry replacements who had just reached Rabaul from Japan and the 3d Battalion, 229th Infantry, a 38th Division unit whose two sister battalions were on Guadalcanal. The 229th Infantry had had combat experience in China, Hong Kong, and Java and was rated an excellent combat unit. The battalion under its commander, Maj. Hiaichi Kemmotsu, together with 300 144th Infantry replacements and the new commander of the 144th Infantry, Col. Hiroshi Yamamoto, was ordered to Basabua on 16 November and arrived there by destroyer the following evening. There were about 1,000 men in the convoy, and their arrival brought effective enemy strength at the beachhead to some 6,500 men, not including troops that might be released from the hospital later on and sent to the front. The incoming troops were transferred to Giruwa by barge and then sent on to the Cape Endaiadere-Durope Plantation-Buna Strips area. Colonel Yokoyama took command of that area, and Captain Yasuda of the area west of it as far as the Girua River. 1. Hist Rec Army Section, Imperial General Headquarters, pp. 65, 67; Southeast Area Naval Opns, I, 45-50; 17th Army Opns, I, 114-115; USSBS, The Campaigns of the Pacific War; pp. 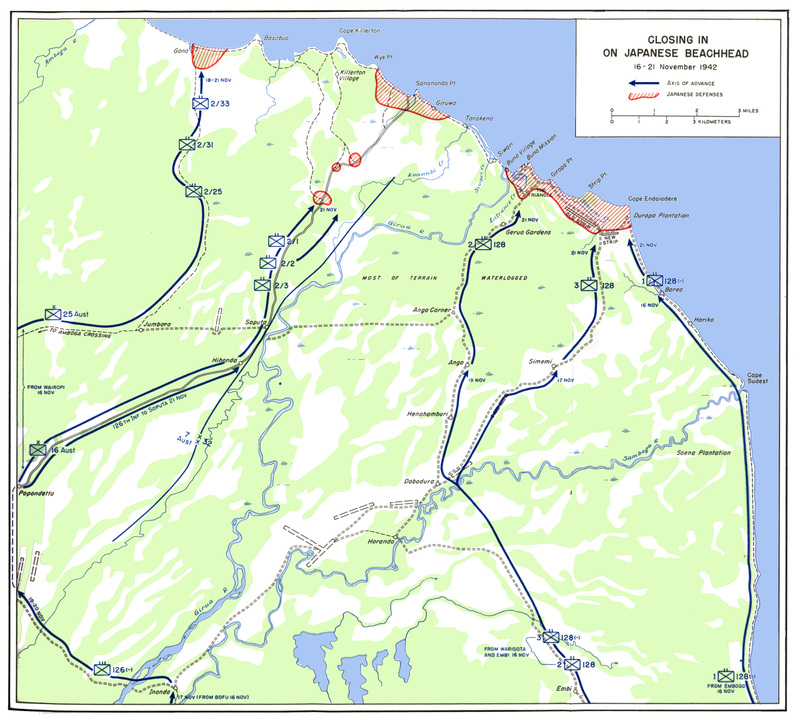 125-139, Miller, Guadalcanal: The First Offensive, pp. 177-89, 230-31. 2. Actually there was no mission at Buna, and what was known as Buna Mission was really Buna Government Station. Likewise, what the Board of Geographic Names officially calls the Senimi River was known as Simemi Creek. Since nearly all records of the campaign refer to "Buna Mission" and "Simemi Creek," these names will be used throughout this volume. 3. Rpt, CG Buna Forces on the Buna Campaign, pp. 2-8, with app. Map B, Buna Campaign Area; WD, Survey of Northeast New Guinea and Papua. 4. NGF OI No. 42, 14 Nov 42. 5. NGF OI No. 43, 15 Nov 42. Msg, Gen Chamberlin to Gen Sutherland, No. C-1237, 14 Nov 42; Msg, P-146, Gen Sutherland to Gen Chamberlin, 14 Nov 42. Both in 384, G-3 Files, GHQ SWPA. 6. Ltr, Gen Blamey to Gen MacArthur, 7 Nov 42; Ltr, Vice Admiral Arthur S. Carpender, Comdr ANF, to Gen MacArthur, A16-3, Ser 00521, 10 Nov 42, sub: Opns for Capture of Buna. Both in G-3 Jnl, GHQ SWPA. 7. R&R, Gen Chamberlin to Gen Sutherland, 10 Nov 42, in 385, G-3 Files, GHQ SWPA. 8. 32d Div FO No. 1, 15 Nov 42, copy in DRB HRS, AGO. 9. Ltr, Col John J. Carew, CO 114th Engr Bn, to Gen Harding, 14 Nov 42, sub: Preliminary Reconnaissance Rpt, Oro Bay Area, Ser 647, in 32d Div G-2, G-3 Jnl; Memo, Gen MacNider for Gen Harding, 15 Nov 42, in OCMH files. 10. Gen Harding's Diary, 15 Nov 42; Msg, Col Tomlinson to Gen Harding, Ser 715, Ser 751, 16 Nov 42, in 32d Div G-2, G-3 Jnl; 32d Div Sitrep No. 47, 16 Nov 42; 32d Div Rpt of Actn, Papuan Campaign. 11. ALF Opns Rpt No. 215, 15 Nov 42; No. 216, 16 Nov 42; No. 217, 17 Nov 42; No. 218, 18 Nov 42. All in G-3 Jnl, GHQ SWPA; Comdr ALF Rpt on New Guinea Opns, 23 Sep 42-22 Jan 43. 12. Ltr, Gen Blamey to Gen MacArthur, 27 Oct 42, in G-3 Jnl, GHQ SWPA; Comdr ALF Rpt on New Guinea Opns, 23 Sep 42-22 Jan 43; NGF Notes on Opns in New Guinea, Ser 3. 13. As of 14 November, the 126th and 128th Combat Teams, and the forward echelon of division headquarters totaled 6,951 men, with more engineer and medical troops still to come. Ltr, CG 32d Div to GOC NGF, 14 Nov 42, sub: Strength Rpt, in OCMH files; Ltr, Gen Harding to author, 26 Feb 50. 14. Order of Battle of the United States Land Forces in the World War, American Expeditionary Forces, (Washington, 1931), pp. 176-91; Annual Rpt, National Guard Bureau, 1941, Table VII, p. 29; AGF, Fact Sheet on 32d Inf Div, 1 Mar 47, in DRB HRS, AGO; Ltr, Gen Harding to author, 26 Feb 50. 15. Durdin, "The Grim Hide and Seek of Jungle War," The New York Times Magazine, 7 Mar 43; Interv with Gen Harding, 9 Dec 47; Interv with Gen Eichelberger, 3 Feb 50; Ltrs, Gen Harding to author, 26 Feb 50, 24 Jul 51; Ltr, Gen Waldron to Gen Ward, 5 Mar 51; Gen Eichelberger, Our Jungle Road to Tokyo, (New York, 1950), pp. 7, 11. Mr. Durdin was on the ground throughout the campaign, having taken over as New York Times correspondent upon Byron Darnton's death. 16. Memo, Gen Richardson for Gen Marshall, 9 Jul 42, Report No. 5, in SWPA-MacArthur File, OPD Exec File: Interv with Gen Eichelberger, 6 Feb 50; Gen Eichelberger, Our Jungle Road to Tokyo, pp. 11, 12. 17. Ltr, Gen Eichelberger to Gen Sutherland, 24 Dec 42, copy in OCMH files; Interv with Gen Eichelberger, 6 Feb 50; Ltr, Col Harry Knight, Cav, to CG AGF, 4 Jan 43, sub: Report of Col Harry Knight in the Southwest Pacific, with incl. U.S. 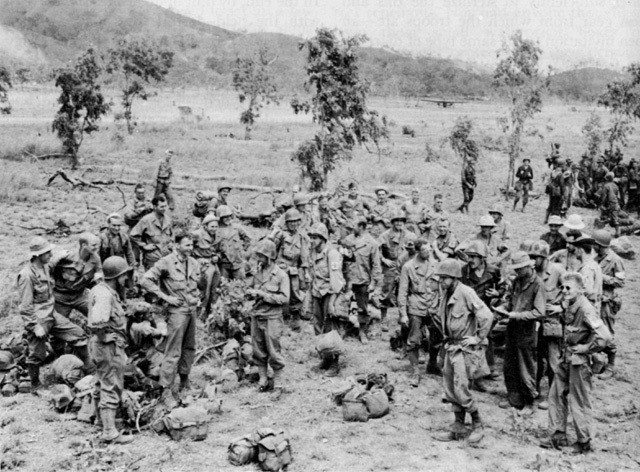 Troops in the Battle of Buna; Ltr, Col Herbert B. Laux, Inf, to CG AGF, 20 Feb 43, with incl. Both ltrs in 381, OPD SWPA File, Sec 4. Ltrs, Gen Harding to author, 26 Feb 50 and 26 Jul 51. 18. Ltr, Gen Harding to author, 26 Feb 50. 19. Ltr, Gen Eichelberger to Gen Sutherland, 8 Dec 42; Rpt, CG Buna Forces on the Buna Campaign, p. 84; Ltr, Maj David B. Parker, CE, to CG USASOS, 2 Dec 42, sub: Notes on Operations near Buna, New Guinea, 14-23 Nov 42, in AFPAC Engr File; Durdin, "The Grim Hide and Seek of Jungle Warfare," 7 Mar 43. 20. Ltr, Col John E. Grose to Gen Ward, 26 Feb 51, with incl; Durdin, "The Grim Hide and Seek of Jungle War," 7 Mar 43; Eichelberger, Our Jungle Road to Tokyo, p. 39. 21. Ltr, Col Carl Hanna, MC, Surgeon 32d Div, to Chief Surgeon USASOS SWPA, 10 Dec 42, in Surgeon General's Hist File: Ltr, Col Hanna to author, 25 Nov 50; Maj Parker's Buna Rpt; Interv with Maj Odell, 14 Dec 50. 22. Col Knight's Buna Rpt; Ltr, Col Hanna to author, 14 Oct 50; Ltr, Gen Harding to author, 26 50. 23. Ltr, Col Hanna to author, 14 Oct 50; Interv with Maj Odell, 14 Dec 50; Hist Medical Activities 32d Div, Papuan Campaign, in Surgeon General's Hist File. 24. Ltr, Col H. F. Handy, FA, to CG AGF, 13 Feb 43, sub: Rpt of Military Observer in the Southwest Pacific Theater of Operations, in 381, OPD SWPA File, Sec 2; Interv with Gen Harding, 9 Dec 47; Ltr, Gen Harding to author, 24 Jul 51. 25. Quoted in AAF, Air Action in the Papuan Campaign, p. 72. 26. Ltr, Gen Waldron to Gen Ward, 5 Mar 51; Ltr, Gen Harding to author, 25 Jul 51. 27. Col Knight's Buna Rpt; Maj Parker's Buna Rpt. 28. Ltr, Gen Harding to Brig Gen Ennis P. Whitehead, 14 Nov 42, copy in OCMH files; Ltr, Maj Herbert C. Wallace, M. C., Actg Surgeon 32d Div, to TAG, 28 Feb 43, sub: Monthly Sanitary Report, in Surgeon General's Hist File; Ltr, Col MacNab to author, 14 Nov 49; Ltr, Col Herbert M. Smith to author, 16 Mar 50. 29. Ltr, Gen Harding to Gen Whitehead, 14 Nov 42. 30. Msg, Gen MacNider to Gen Harding, Ser 769, 17 Nov 42; Msg, Col John Mott, CofS 32d Div, to Gen MacNider, Ser 777, 17 Nov 42. Both in 32d Div G-2, G-3 Jnl. Ltr, Col Herbert A. Smith to author, 20 Jan 50; Ltr, Lt Col Herbert M. Smith to author, 16 Mar 50. 31. Ltr, Col Herbert A. Smith to author, 20 Jan 50; Interv with Col Baetcke, 17 Nov 50; Interv with Maj Odell, 14 Dec 50; Kahn, G. I. Jungle, pp. 108. 32. Ltr, Col Herbert A. Smith to author, 20 Jan 50. 33. Eichelberger, Our Jungle Road to Tokyo, p. 23. 34. 32d Div G-2 Intel Summaries No. 6, 13 Oct 42, No. 7, 21 Oct 42, No. 8, 29 Oct 42, No. 9, 5 Nov 42, in DRB HRS, AGO; Col Handy's Buna Rpt; Col Knight's Buna Rpt; Ltr, Col MacNab to author, 15 Nov 49; Ltr, Col Herbert A. Smith to author, 20 Jan 50; Ltr, Lt Col Herbert M. Smith to author, 5 Jun 50. 35. Ltrs, Gen Harding to Gen Sutherland, 14 Oct 42, 20 Oct 42, 31 Oct 42, copies in OCMH files. 36. Col Handy's Buna Rpt. 37. Col Knight's Buna Rpt. 38. 32d Div G-2 Daily Summary, No. 9, 6 Nov 42. 39. GHQ SWPA OI No. 23, 10 Nov 42; G-2 Daily Summaries Enemy Intel No. 235, 12-13 Nov 42, No. 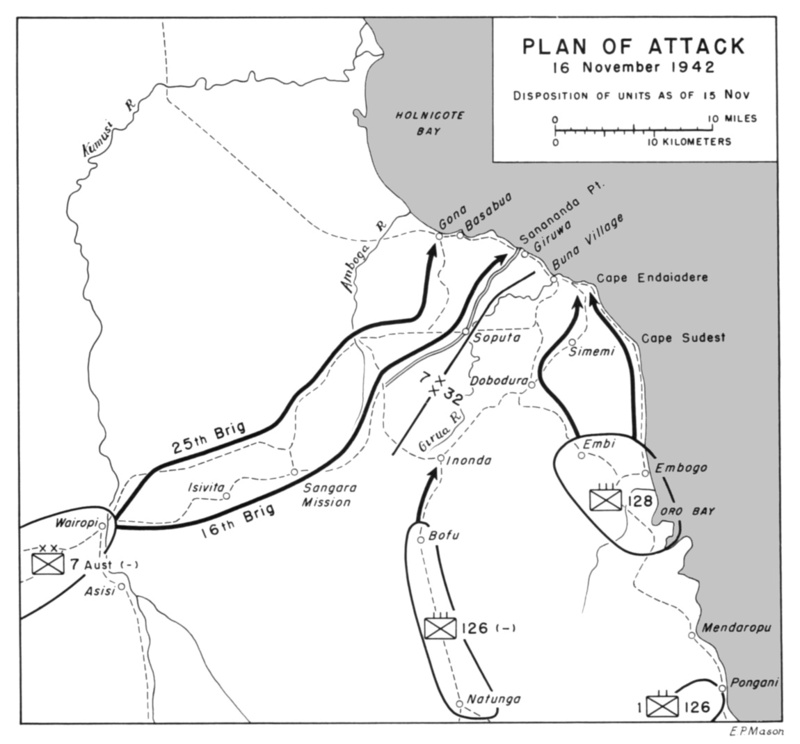 237, 14-15 Nov 42. 40. Msg, 7th Aust Div to Adv NGF, Ser 733, 14 Nov 42, in 32d Div G-2, G-3 Jnl. 41. 132d Div Intel Rpt, Papuan Campaign. 42. 32d Div, FO No. 1, 15 Nov 42. 43. Memo, Col Russel Reeder, WDGS, for Col William L. Ritchie, Chief, Southwest Pacific Gp OPD, 22 Feb 43, in 381 OPD SWPA, Sec 1; Col Knight's Buna Rpt; Col Handy's Buna Rpt; Col Hale, Answers to Questions by Hist Sec, GHQ SWPA, as to Certain Phases of the Papuan Campaign; Ltr, Lt Col Herbert M. Smith to author, 5 Jun 50; Eichelberger, Our Jungle Road to Tokyo, pp. 19, 20. 44. [Japanese] Estimate of the Situation, 16-17 Nov 42, in ATIS RP 29; ALF, Rpt on New Guinea Opns, 23 Sep 42-22 Jan 43; Rpt, CG Buna Forces, pp. 9, 39; 163d Inf CT, The Battle of Sanananda, in DRB HRS, AGO; Buggy, Pacific Victory, pp. 196-97. 45. Rpt, CG Buna Forces, p. 10; Buna Target Plan [Map] No. 24, in DRB HRS, AGO. 46. Tel Msg, 18th Bde to 32d Div, Ser 3609, 18 Dec 42; Msg, NGF to 32d Div, Ser 3740, 19 Dec 42; Memo, Maj W. D. Hawkins, 32d Div G-2, Ser 3814, 21 Dec 42, sub: Constructional Details of Enemy Emplacements. All in 32d Div G-3 Jnl, 127th Inf Jnl, Ser 32, 21 Dec 42; Memo, Lt Col A.F.A. Irwin, RAE, 6th Aust Div, to Brig George F. Wootten, 18th Bde, 4 Jan 43, sub: Japanese Strong Points--Expedients in Assisting Attack, copy in OCMH files; Rpt. CG Buna Forces, pp. 96-98; 163d Inf TC, The Battle of Sanananda, with incls. 47. Yokoyama Det Orders, 18 Nov 42, in ATIS EP 29; 17th Army Opns I, 130; 18th Army Opns I, 22. 48. Rad, 67th LofC Hospital, Giruwa, to CofS 17th Army, 15 Nov 42, in ATIS EP 29; AMF Interr Gen Adachi et al. ; 17th Army Opns I, 129-30. No precise figure can be given for Japanese strength at the beachhead in mid-November, but it is possible to support the figure given above. When questioned at Rabaul in 1945, General Adachi (who should have known as he took charge of New Guinea operations two weeks later) gave the total Japanese strength on 15 November as 9,000. His figure, however, included approximately 900 troops who were then with Colonel Yazawa on the other side of the Kumusi, and another 900 who did not reach the beachhead from Rabaul until two days later. As it is known that some 1,800 men were hospitalized at the time in the 67th Line of Communications Hospital, it can be estimated that there were at least 5,500 effectives at the beachhead in mid-November, including of course, Army and Navy laborers. 49. Nankai Shitai Opns Orders TEI No. 35, 6 Oct 42, in ATIS EP 29; 67th LofC Hospital Fld Staff Diary, 1-31 Oct 42, in ATIS EP 24; 18th Army Opns I, 20-21; Rpt, CG Buna Forces, pp. 42-44. The Japanese had been evacuating their sick and wounded to Rabaul whenever the opportunity offered, and appear to have returned a number of their naval construction troops as well, presumably for more pressing construction work elsewhere. 50. Yokoyama Det Bul, 2 Dec 42, in ATIS EP 24. 51. 67th LofC Hospital Rpt of Service, 31 Oct 42 in ATIS EP 24; Rad, CO 67th LofC Hospital to CofS 17th Army, 15 Nov 42; Yokoyama Det Bul, Giruwa, 22 Nov 42; Rad, Lt Col Yoshinobu Tomita to CofS 17th Army, 23 Nov 42. All in ATIS EP 29. Interr, Lt Zengoro Sawatari, Med Off, 14th Inf in 32d Div Interrogation and Translation file; 18th Army Opns I, 25. 52. Captured Japanese Diary, owner unknown, entry 27 Nov 42, Ser 3624, 18 Dec 42, in 32d Div G-3 Jnl. 53. 18th Army Opns I, 21, 24. 54. Yokoyama Det Orders, 16 Nov 42, in ATIS EP 29; Japanese Strength and Dispositions on the Soputa-Sanananda Track, 20 Nov 42, translation of an enemy map captured at Gona by New Guinea Force, 8 Dec 42, in OCMH files; 18th Army Opns I, 20-21; US Buna Forces G-2 Periodic Rpt, 14 Dec 42-4 Jun 43, in DRB HRS, AGO; Rpt, CG Buna Forces, pp. 43, 77. 55. [Japanese] Estimate of the Situation, 16 Nov 42, 17 Nov 42; Tomita Det Bivouac Orders, Giruwa, 17, 18 Nov 42. All in ATIS EP 29. 17th Army Opns I, 129-30; 18th Army Opns I, 16, 21. 56. 1st Demob Bur, GHQ FEC, Japanese Studies in World War II, No. 37, 8th Area Army Opns, p. 1; 17th Army Opns I, 131; 18th Army Opns I, 22-23.